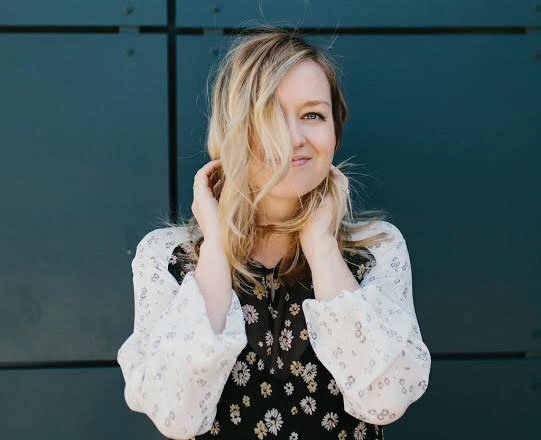 This crazy holiday rush the last few weeks has had me (Lauren) dreaming about vacation, like a real one. But with not a one in site, I’m grasping at memories from my past. The last major vacation (and most dreamy ever) was to Scandinavia where Chase and I visited Denmark, Sweden, and Norway. It was one of those once in a lifetime vacations. There are so many things I could tell you I loved about that vacation but of course, I’m focusing on the topic of food. One of our unforgettable memories as we travelled through Scandi-land was the open face sandwiches. It seemed to be on every lunch menu and boy did we love them. These were not just your average gourmet sandwich, these were flavor packed, beautifully crafted works of art. I had to figure out how to capture that flavor and I think I have come pretty close with these super easy Salmon Burgers. 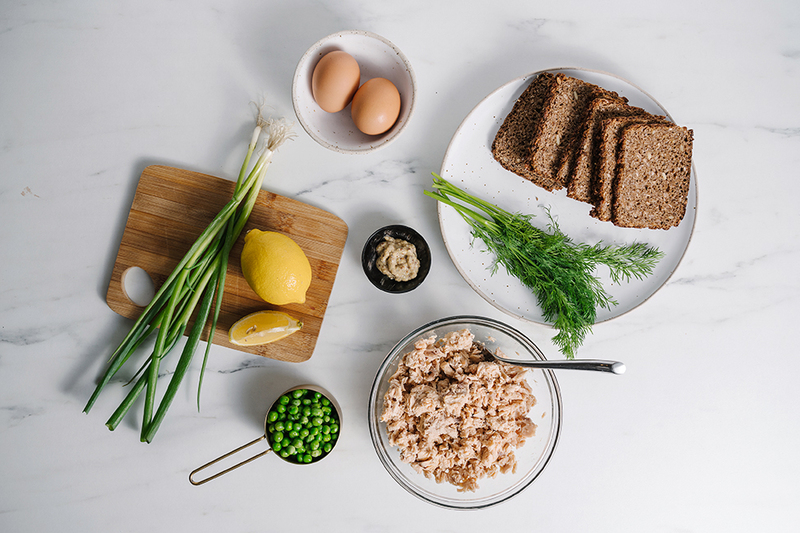 In Danish, the open faced sandwich is called smørrebrød, it usually consists of a piece of a dense, dark brown bread (like rye or pumpernickel) topped with cold cuts or fish, a spread, and finished with veggie garnishes. 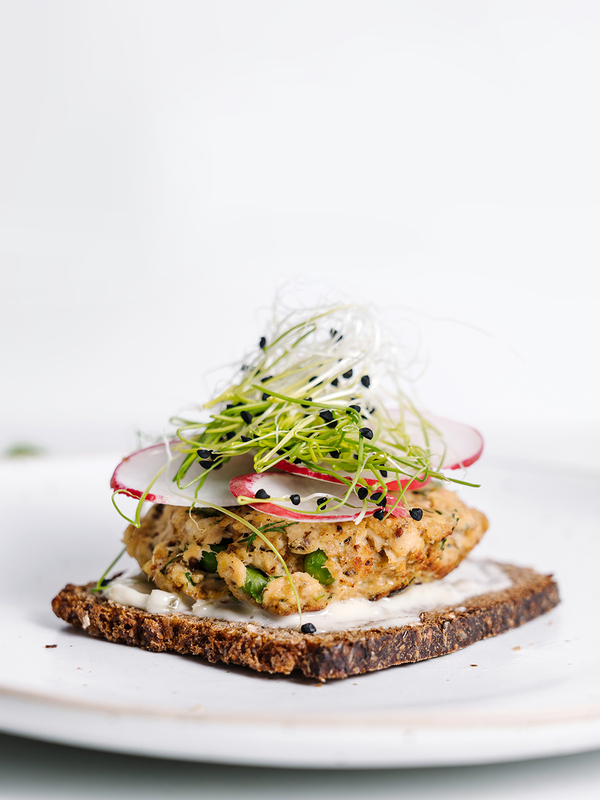 So while dreaming of Scandi, I thought up these delish salmon burgers that encompass one of the open face sandwiches I tasted and most vividly remember (and wish I could eat daily). The centerpiece is the salmon but the star is the dill. I didn’t think you could fall in love with an herb until I experienced how perfectly it can be used on a simple open face sandwich. 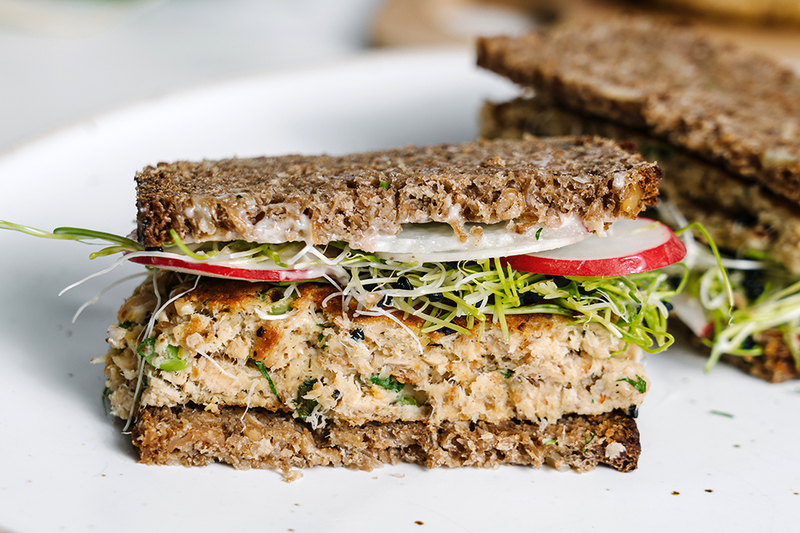 These Salmon Burgers are the perfect weeknight main because it can thrown together in a few minutes, and is even yummy cold so it makes for great leftovers. You can of course use cooked fresh salmon, but what makes this so simple is making it with canned salmon. 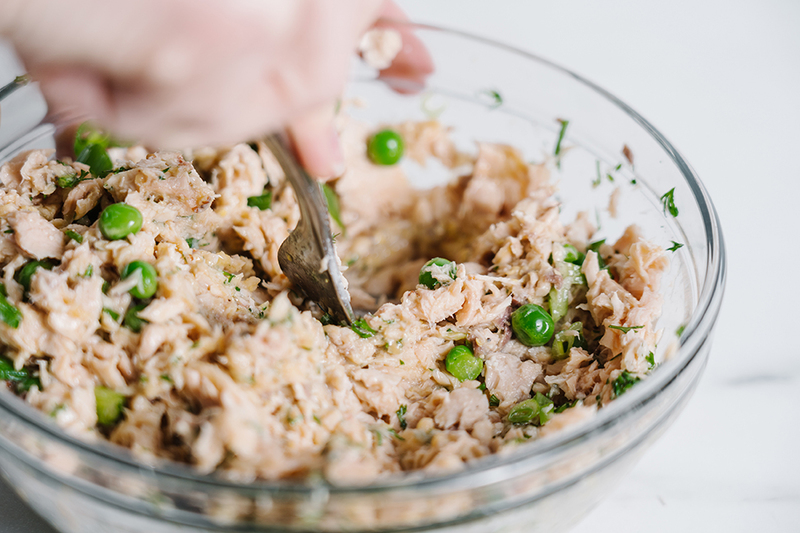 You may not have considered canned salmon before but I promise you will not be disappointed. I recommend using a sustainably farmed Alaskan pink salmon, sockeye, or red salmon in a non-BPA lined canned. This brand is what I use. The Alaskan salmon fishery is a well-managed, safe, and sustainable fishery, this is the most ethical choice for fish. As far as assembling and cooking everything else is simple. Plus, feel free to get creative and build it as you like, my favorite toppings are a little tartar, radishes, and sprouts. Enjoy it open face as the Danes do or Americanize it in a bun. The flavor of these Salmon Burgers is fresh and light and yet somehow still warm and comforting. 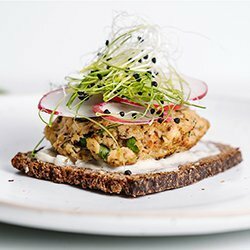 This delish salmon burger encompasses one of my favorite open faced bites from my visit to Denmark. The centerpiece is the salmon but the star is the dill. 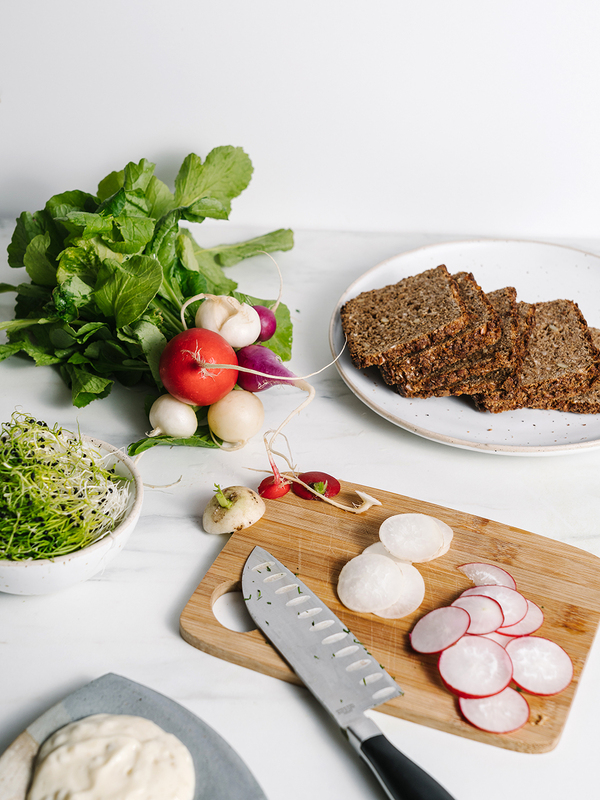 Enjoy as the Danish do, open faced or traditionally between to buns. 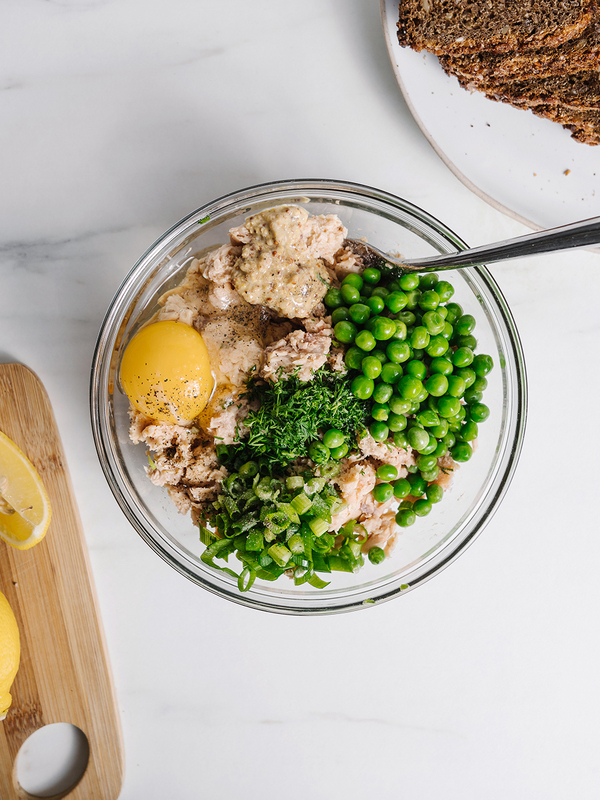 In a medium mixing bowl combine salmon, green onion, fresh dill, eggs, lemon juice, mustard, breadcrumbs, peas, salt and pepper. Once mixed well form into patties. Heat oil over medium-low heat then add patties and cover with a lid and cook for 3-4 minutes. 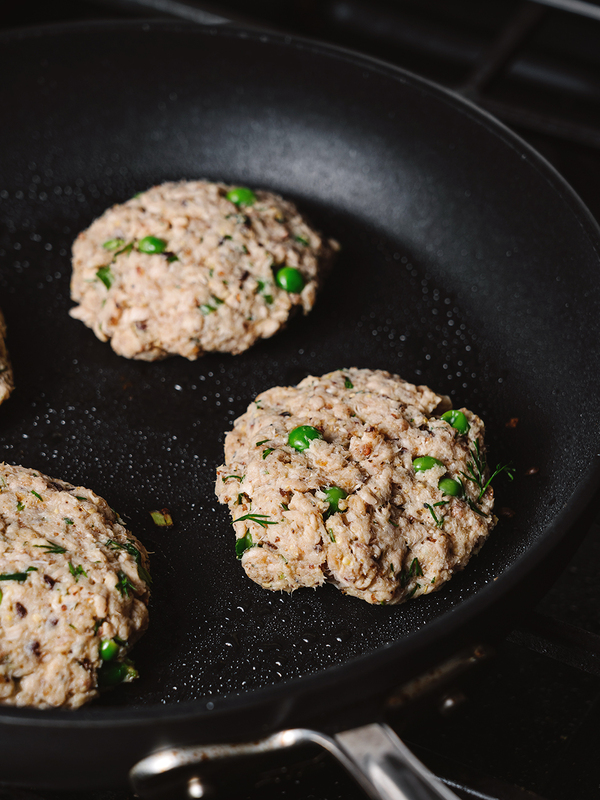 Keep in mind that salmon burgers are a bit more tender and flaky than meat burgers so just take care when flipping. Flip and cover for another 4 minutes or until both sides are browned. 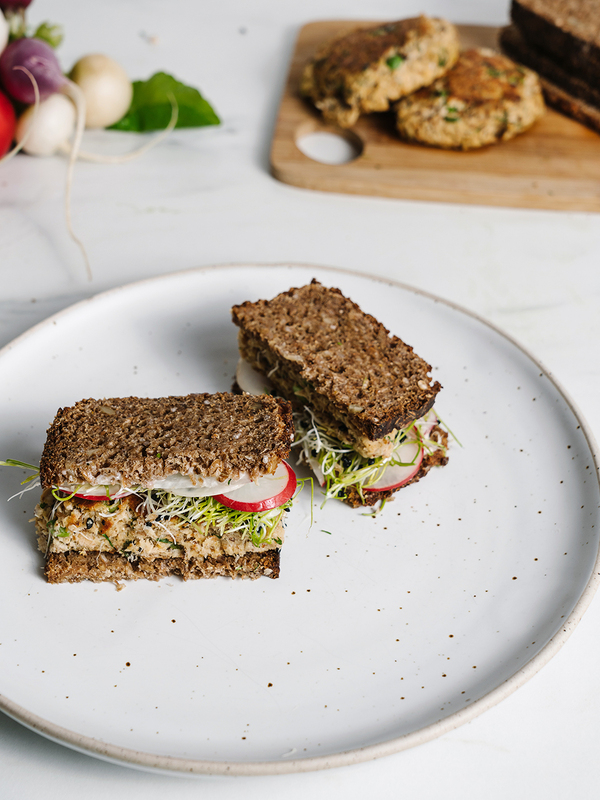 Serve on dark bread topped with sprouts, radishes, and tartar. You can use dried dill but bring it down to about 1.5 tbsp. I might have to go to the grocery store tonight to get some of these ingredients! Have you tried them yet?! I’ve added it to our list for next week, too! These look incredible! They remind me of something I used to make years ago when we first got married! If I did lettuce instead of bread would these be whole30? I’m dying for a meal that doesn’t involve a poached egg or a sweet potato!